Can you believe it, first day back at work after over two years and my little boy has a fever! So I've booked an extra day of childcare for this important day and I'm thinking about whether to take a sickie or not! Yeah, not a good look. Fortunately, I have a wonderful husband who ended up staying at home for the day instead and I'm sure this is just the first of many days where we pay for childcare but don't use it. Mind you, it was gorgeous, when our son waved goodbye to me saying, "Mummy go to work. Matt Matt stay at home with my Daddy." Well, it's official. Our toddler loves his new childcare! He wakes in the morning and asks, "New childcare today?" No, not today... on Thursday you go to childcare. "Today not Thursday?" No, today is Saturday. You've got to love it! As for me? I love childcare! It's been 2 weeks of settling in and things are going great, after a minor hiccup. One of the best aspects of where we are going is that the centre is new. This means I am able to walk into the kitchen in the morning and have a chat to the chef if I need to. They went out to the shops with our list of approved foods and haven't raised any concerns about having to buy specific brands for our son's allergies. In fact, they've decided that on the two days he attends, they will simply cook using only his ingredients for all of the kids! That reduces the risk of contamination at the lunch table and helps our little boy feel like he's just one of the kids. This was the third centre I considered because even in the suburbs, it can be hard finding a suitable place. The second centre I considered didn't even give me all the right forms for his allergies. If they can't even give me the right forms, how are they going to actually understand the complications of it all? But I'm not upset - afterall, it meant that I had to look elsewhere and have now found a place that has surpassed my expectations in may ways. So I can return to work knowing that my son is being carefully cared for. Two weeks of someone else feeding our son and not a rash in sight... Priceless. Wow, I am so excited - this is my first successful attempt at making something with a few more ingredients. I have tried making little patties before from chicken mince as well as beef mince but with only a few ingredients to work with, they have always turned out dry and very strong in their meat taste. Thus, my little one has a taste and that's about it. So I'm very very excited that he has already eaten 4 small patties and is currently working his way through another four! Mix all ingredients together in a bowl. If the mix is too dry, simply add more water to moisten the mix. Shape into small balls, then flatten in your palm. Fry gently on both sides in whatever oil you choose. I just fried a little bit up first to see if I like the taste. I ended up eating quite a few... taste testing of course! But yum! I also fried up some leftover rice in the pan afterwards to soak up the juices. This is a handy way to flavour any carbs or vegies - I use rice, potatoe, corn - whatever I have on hand. My son loves to eat top quality meat – simply picks it up with his little fingers and feeds himself. The baby pasta I’m afraid isn’t mess free. However, it is small so that toddlers can manage to get some of it onto their spoon without too much drama. Whether they get it into their mouth will depend totally on the individual! This recipe uses soy sauce as well as pasta. The soy sauce I used is called Tamari, reduced salt soy sauce, made by Abundant Earth. Although I should be able to use normal soy sauce with my son, the fact that this soy sauce says it is wheat free hopefully means that the company is more serious about not contaminating it with other ingredients. I am always a little wary of products made in Asia, despite what the ingredient labels say. I used San Remo Soup Pasta – for some reason, all the other wheat pastas made by this brand say they can contain traces of milk and egg. The soup pasta is the only wheat pasta we can use made by San Remo, although I think there are wheat-free products we can probably use. 1, Slice meat into bite size pieces. Marinate in Soy sauce if you are able to, or whatever flavouring you choose to use. I have used no flavouring up to now, so my son thinks soy sauce is amazing! 2. 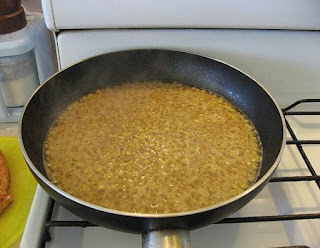 Melt Nuttelex in a pan, or simply use whatever oil you choose. 3. Add meat and cook until just done. 4. Take out meat to cool and serve. 5. Add enough water to the pan to get the flavour from the pan. 6. Add San Remo Soup Pasta – however much you choose to cook then add water to suit. 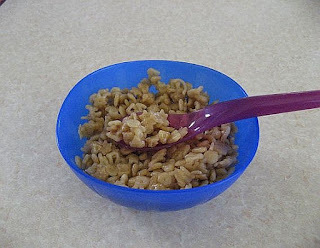 The more pasta you use, the more dilute the flavour will be. I typically cook enough for 2 meals for the little one. 7. I let the pasta simmer until done, stirring occasionally. I only add enough water for the pasta to totally absorb. I simply add about ½C at a time, and if the pasta is not yet done, I add another ½C and stir. This should leave with you with a moist pasta and not too much soup to splash everywhere. Of course feel free to add other vegies to it too, but for some reason our toddler doesn't seem to like it when there are multiple ingredients in a dish. He will go through and pick what he wants, leaving a very very big mess. Thus, I serve the vegies afterwards, as third course. Our son loved the taste of Vegemite, but it gave him diarrhea for a week. For some reason, when you tell people this, they all let out a sigh and say yes, it's probably the yeast... but nobody every says anything about any problems when you tell them you're thinking about giving it to your child! Oh well, we'll give this another go in about a year when hopefully his digestive system improves.